If enabled for your organization, you can view and select datasets to import from the Data Mart. The Data Mart feature mitigates the need for you to invest significant amounts of time in gathering hazard and event data yourself. Within the Data Mart, you can choose from an expanding selection of data and with one click have the data imported into your organization to begin analysis against your exposures. The Data Mart also enables you to easily add visual map overlays to your dashboards, like FEMA flood zones, precipitation, and cloud cover. This list will only continue to grow as we add more data sources and as you prepare your own data. For detail, check out this article on Data Mart Upload Requests. 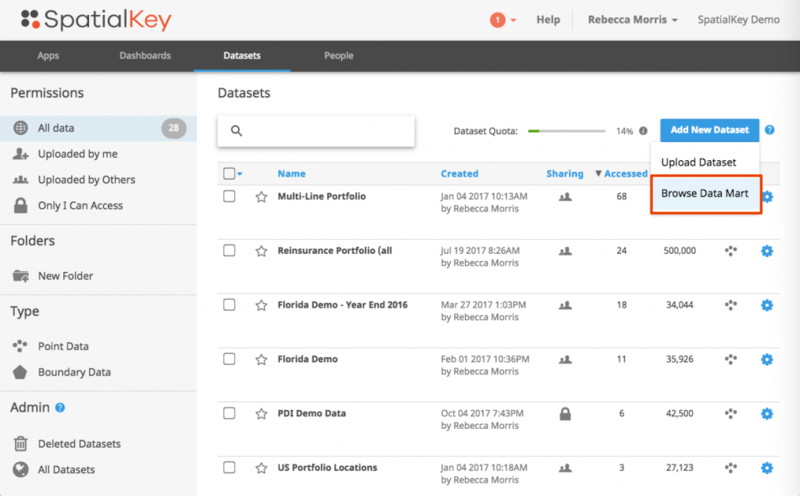 The Data Mart can be accessed from two areas within SpatialKey. First, you can access the Data Mart via the “Add New Dataset” button on the Datasets tab. Alternatively, if you are already in a dashboard and realize that some data from the Data Mart would really enhance your dashboard, you can access the Data Mart by clicking to “add more data” and then selecting the “add from Data Mart” option. Select a dataset from the Data Mart to import so you can interact with it in SpatialKey. After importing a dataset from the Data Mart, it will be available in your Datasets tab. If a new version of an imported data mart item is available, the dataset will be flagged with “update available” and you’ll be given the option to update to the latest. 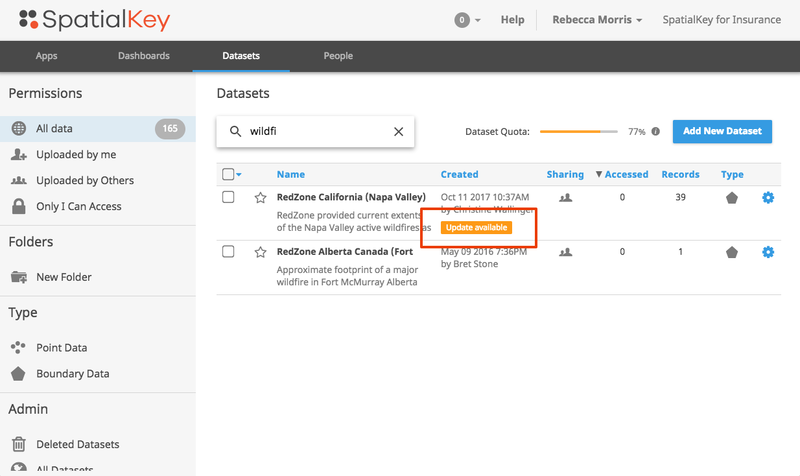 From the Datasets tab, you will have the option to “update” the dataset if an update is available. This will update the existing dataset to the most recent version and all dashboards that use that dataset will benefit from the updated information. You can see if an update is available from the datasets list and from within the settings for a dataset. You can update the dataset to the latest from the data mart from within the dataset settings details screen. From within a Dashboard, you will have the option to “use as is”, “update and use”, or “load another version”. “Use as is” will just add the already imported dataset to your dashboard. 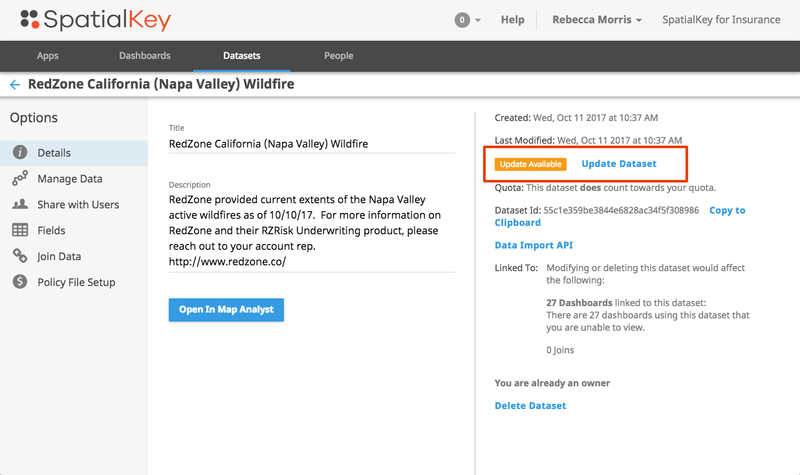 “Update and use” will update the existing version of the dataset in the Datasets tab to the most recent version and all dashboards that use that dataset will benefit from the updated information. “Load another version” of the dataset will import another copy of the dataset – the existing dataset that was already imported will remain unchanged.